Overall, January’s unemployment numbers show that the current unemployment rate is only 0.1 percent higher than the June 2007 unemployment rate. This is good news for many American workers, as it suggests that the labor market has fully recovered from the last recession; however a recent CEPR post on prime-age employment goes into more detail of why that might not be entirely true. But when just analyzing the unemployment rate through varying demographics, CEPR found that some workers have fared better than others. Teen unemployment (workers 16 to 19 years), although still significantly higher than that of adult workers, has actually dropped below 2007 levels. Black teens in particular now have 3.3 percent lower unemployment. White teen unemployment rates have also decreased 0.8 percent. Both remain high, and the unemployment rate for black teen workers is nearly double that of white teen workers. 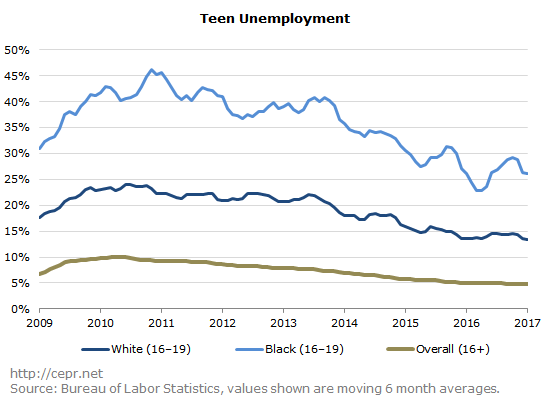 Black teen workers also experienced a greater increase in unemployment from 2009 to 2011 than white teens, with their highest unemployment rate 46.1 percent in 2010. For prime-age workers (those ages 25 to 54) most still have slightly elevated unemployment rates compared to 2007. This is especially the case for black female workers whose unemployment is still 1 percent higher than it was in 2007. Only black male prime-age workers have lower unemployment rates following the recession, their unemployment has decreased 0.2 percent since 2007. However, black men also had significantly higher increases in unemployment from 2009 to 2012. At the peak of unemployment, black male workers were at 17.6 percent unemployment, compared to 9.5 for white male workers. Black women’s unemployment was on the rise until 2012, when it was at 13.3 percent, and has been declining steadily since. 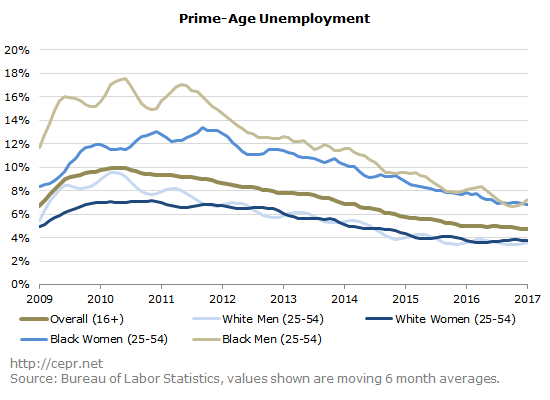 Black men continue to be unemployed at higher rates than black women, although their employment numbers in the last year have become fairly similar. White women had the lowest unemployment, and smallest increase in unemployment, of any group with their peak unemployment at 7.1 percent. For white workers, women’s and men’s unemployment synced around 2012 and have remained similar since.